This beautiful neighborhood is unique in that it offers both WHOLE and FRACTIONAL ownership opportunities. Whole interest starts in the $600's and fractional starts in the $30's. 5 Star luxury resort living professionally managed by world famous Fairmont Hotels, through their Heritage Place division. Live on vacation and enjoy luxury locations throughout the world. Beautiful 3 bedroom homes with garage in a picturesque community on a large bay (but minutes to the beach and surrounded by a golf course), and of course within the gates of Sandestin Golf and Beach Resort. Whole ownership homes in this neighborhood are fully rental capable. 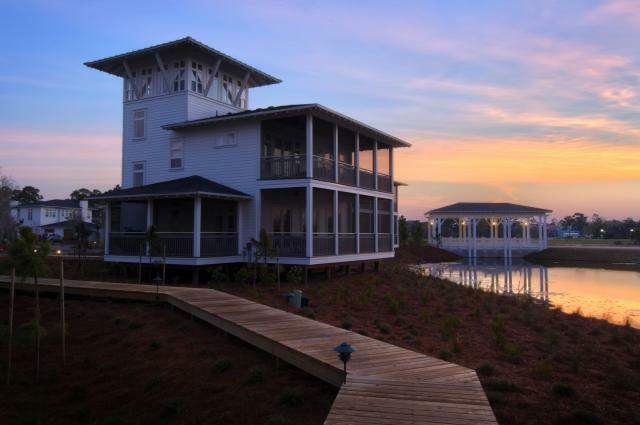 Inspiration owners enjoy a community dock for easy access to the bay for fishing or kayaking. A beautifully appointed Owners Club House includes a heated & chilled pool, heated jet spa, onsite fitness facility, indoor/outdoor treatment rooms, summer kitchen and all of the amenities of a private residence club including onsite personal concierge and staff for all your needs. These Florida Cottage style homes feature a master bedroom suite on the first floor, an open floor plan with gourmet kitchen complete with Viking stainless steel appliances and marble countertops, a large living and dining area and a large screened porch, with a grill and plenty of seating for quiet enjoyment. The 2nd floor offers a second master suite, guest bedroom and children's bunk room and a media room/den. The 2nd floor offers an additional large screened accessed from both the second floor master and bunk room. Some homes offer an extra get-away space too, a 3rd floor tower room with a wet bar and plenty of space for relaxing with 360 degree views! Inspiration is only a few minute walk to the Village of Baytowne Village with shops, restaurants and entertainment. Also a short walk to the Marina and Sandestin Tennis Center. Best of all, the possibility exists to participate in an exclusive reciprocal use program through Fairmont Heritage Place for exchange with other Fairmont locations and also Registry Collection locations. A community where you are welcomed by name, the Owner Service Team is dedicated to exceeding all your expectations. Trading opportunities available to you as an owner offer the promise of unparalleled settings, rich experiences and lasting memories in properties around the country and around the world. Fractional owners automatically receive membership to the Fairmont President’s Club offering upgrades to best available suites, preferred rates and expedited check in throughout all Fairmont Hotels. Whole owners can also elect to become members. Paul Ingevaldson, Chicago, Owner since 2005: The best part of living in Inspiration is the carefree life style it supports. It is a second home without the hassles of second home ownership since everything is taken care of by the Fairmont staff. It is a place where “everyone knows your name” and we always look forward to our visits.